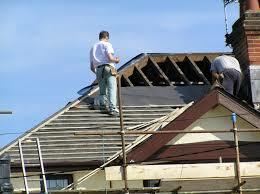 Roofing is one of the most important building trades there is. A good roofer can provide homeowner with the confidence that they are getting the best craftsmanship and quality available. A poor roofer can have just the opposite effect, leaving the homeowner dispirited and cynical about roofers and roofing in general. That is why it is so important that anyone who has trouble with their roof call a roofer who has the experience and expertise to get the job done right the first time. There are many reasons why people call roofers. The most common reason is to have emergent damage repaired. But there are those who think long term about the condition of their roof. Indeed, roofs, just like most other material things, are worn down over time by the ravages of the elements and the day-to-day wear and tear of existence in the world. Eventually, such wear begins to show as the structural integrity of the roof begins to weaken. In order to prevent catastrophic collapse or the slow emergence of cracks and breakages in the roof it is necessary to conduct maintenance on it regularly. A qualified roofer can provide that kind of assistance. Such a roofer can help you formulate a long term schedule for the maintenance of your roof, so that you can keep it in good working order for years to come. But the implementation of that kind of preventative maintenance strategy is the exception rather than the rule. Most people call roofers because they need help resolving an emergent problem. Now, it is always tempting in such circumstances to either call ‘a friend’ or to attempt to do the work yourself. Serious safety concerns arise when either of these options is pursued. Most amateurs do not have the equipment and expertise to conduct the kind of specialized work of roof repair. And if you or the person you’ve asked to help you go on the roof without taking appropriate safety measures you will be courting danger. It is also likely that the job will not be adequately done. Again roof repair requires skills and materials that are not so easily gathered by laypersons. Only a professional roofer has access to the material and has undergone the training necessary to conduct a thorough and high quality roof repair. That is why it is important that those who need a roofer to repair or replace their roof call a professional. Fortunately, it is not that hard to find a professional roofer. The best place to begin your search for one is on the worldwide web. Using the web will enable you to bring all of the various roofers in the Palo Alto and other areas to your computer screen; then, from the comfort of your home or office, you will be able to review all of the services and deals that each one has to offer. Deciding which roofer to work with is an important step in the process of getting your roof repaired. The web will enable you to make an informed choice on this vital matter.